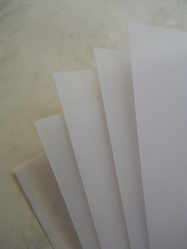 A pack of 5 sheets of A5 size (15 x 21cm) 90 gsm professional quality tracing paper. Use this paper in conjunction with the 'Prick and Pounce' kit, to transfer your embroidery designs. Trace your outline design onto the paper, prick holes along the lines with the pricker and pounce the design onto your chosen fabric with the pounce pad and powder. Suitable for smaller designs up to A5.